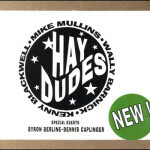 The Hay Dudes are Kenny Blackwell, Mike Mullins and Wally Barnick. Friends by musical association for over 30 years, they have crossed paths many times at festivals and casual gigs. Sometime around 2009 a few calls came in to Wally from folks wanting some “bluegrass” music for their backyard or other casual events. Naturally, Kenny and Mike would be contacted due to their friendship and proximity to Wally, and before long an impromptu set list began to emerge. Most importantly, it was fun to do, and coincidentally, to them at least, it sounded pretty good! Notably, all of the players are veteran musicians having played nationally and internationally with a variety of groups. Kenny was previously a member of the Laurel Canyon Ramblers, and is a current member of the old-time music group Little Black Train. Mike is a former member of The Phil Salazar Band and The Acousticats, and is a current member the Cache Valley Drifters. Wally is a circuit player with over half dozen California based groups. He toured Europe, Canada and the U.S. in 1997-1998 as bass player and vocalist for Bluegrass, Etc. and was a featured vocalist on their album Home is Where the Heart Is. After dozens of LIVE performance appearances together, the fellows have settled in pretty well on the material from their 2013 self titled album and continue to add to their playlist. They are having a blast and look forward to many more years of playing together. Fiddler Paul Lee has been fiddling with the ‘Dudes over the last few months and will join the group for this Parkfield event and other 2015 dates. Paul is an in- demand session player, an instructor and plays the circuit with a variety of groups. © 2019 Parkfield Bluegrass Festival. All Rights Reserved.